We have seen what P&G, HUL and Marico are doing with some of their brands on Facebook and on digital overall, in India. In the next couple of days, I hope to cover some ground on J&J brands, starting today with Neutrogena. Neutrogena’s brand page on Facebook has product information and brand videos around the key products they are promoting - Fine Fairness Mask and Neutrogena Rapid Wrinkle Repair. There is an E-gift application through which you can give your friends a 20% discount coupon on Neutrogena products. 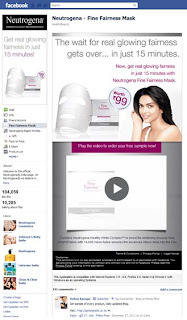 A great social and viral way to promote the seamless Neutrogena E-Store that the website boasts of. The E-store user experience on the site is smooth and it offers the full range of Neutrogena products with product detailing and to top it all there are some amazing deals on the site, including free shipping and cash discounts. Highly recommended. The Facebook Page also promotes Face2Face, which is Neutrogena’s shot at community creation with their core women TG. Users need to sign up to become members and they get access to a personalised beauty program, complete with skin tips, expert advice, invites to events and special offers.What I really like about Neutrogena’s Website and Facebook Brand Page is simplicity and efficiency. They achieve what they set out to do. Hopefully, with better digital promotions and word-of-mouth, users will discover these assets.